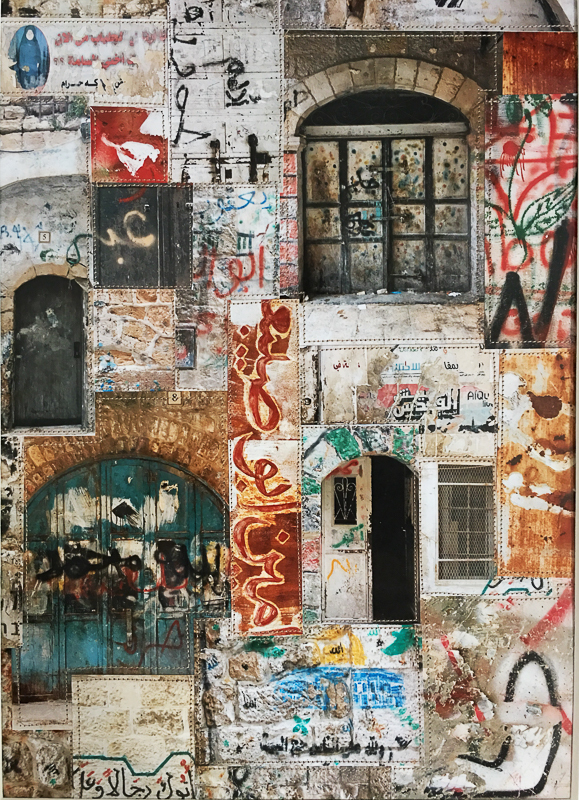 A photo collage inspired by marks and graffiti on doors and walls in Jerusalem’s Old City and Nachalot neighbourhoods. If every picture tells a story, this collection of snapshots, intricately stitched together, conjures up a glimpse of multiple messages communicated to us by unknown phantom writers. Viewed from a distance, the overall effect is striking; close up, the details of each separate image absorb the viewer’s attention and demand greater scrutiny. These unique prints have been signed personally by the artist. Helen is a British mixed media and textile artist inspired by urban street art and graffiti. Fascinated by stories of people’s lives and city decay and regeneration, Helen’s art explores how communication affects our understanding and acceptance of others whose lives are very different to ours or with whom we find ourselves in conflict. Her studio is based in St Helens, Merseyside, UK.